A3 Size 10.7 x 13.7 in. (418 x 530 mm) 19.6 x 24 in. LARGE 21 x 26.4 in. (530 x 670 mm) 24 x 30 in. 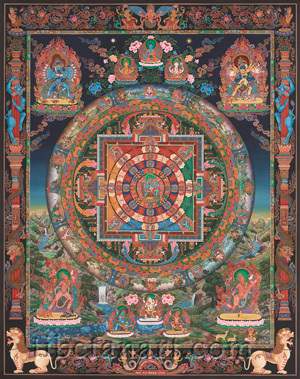 This complex painting depicts the sixty-two-deity mandala of Chakrasamvara, according to the tradition of Luipa. Chakrasamvara is semi-wrathful and blue-black in colour with four heads, two legs and twelve arms, and he stands on the central dais of the mandala in sexual union with his two-armed red consort, Vajravarahi. On the eight petal lotus or 'Wheel of Great Bliss' that encircles the dais are four ritual vases that support nectar-filled skulls, and the four 'Heart Dakinis': blue-black Dakini (E); green Lama (N); red Khandarohi (W), and yellow Rupini (S). The next three circles are divided into eight directional vajra-like segments, which collectively contain the forty-eight two-armed assembly of 'dakas and dakinis', who all stand in the same postures in sexual union. The first circle contains the eight blue deities (dakas and dakinis) of the blue 'Mind Wheel'; the second circle contains the eight red deities of the red 'Speech Wheel', and the third circle contains the eight white deities of the white 'Body Wheel'. In the mandala's four corners and gateways are the eight dakinis of the outer 'Commitment Wheel', with the gateway dakinis being: black crow-faced Kakasya (E); green owl-faced Ulukasya (N); red dog-faced Svanasya (S); and yellow boar-faced Sukarasya (S). Along with Chakrasamvara and Vajravarahi, these dakas and dakinis constitute the sixty-two deities of this mandala. A ring of jewels and the three protection wheels of the lotus-womb, vajra-fence, and mountain of fire encircle the complex structure of the mandala palace, with its four great gateways and intricate array of roof ornaments. And outside these wheels is the highly symbolic circle of the 'eight great cemeteries' or charnel grounds. In the sky above the mandala are the Newar representations of the 'Three Jewels', consisting of blue Akshobhya (Buddha), yellow Prajnaparamita (Dharma), and white Avalokiteshvara (Sangha). And in the upper left and right corners are sixteen-armed Hevajra, and twenty-four armed Kalachakra. In the lower left and right corners are Vajrayogini as Naropa's Dakini, and flying Vidyadhari as Maitripa's Dakini. At the bottom centre is four-armed Ganapati, with blue Vajrapani and red Khadgapani to his left and right. The dark outer torana of this painting is decorated with the forms of a garuda, naga serpents, and flute-playing kinnaras at the top; blue lions, red dragons and ornate pillars on the sides; golden lions in the lower corners, and naga-serpents on either side of the inscribed plaque at the bottom centre. This complex mandala was painted by Ratna Gopal Sinkhwal in 2005 and took a year to complete, and it depicts the sixty-two-deity mandala of twelve-armed yidam deity Chakrasamvara, according to the tradition of the Indian mahasiddha Luipa. Chakrasamvara appears on the central dais of the mandala. He is semi-wrathful and blue-black in colour, with twelve arms, four faces, and twelve eyes. He stands in alidha posture upon a golden sun disc and lotus, with his left foot pressing upon the head of black Bhairava, and his right foot pressing upon the breasts of red Kalaratri. Bhairava and Kalaratri are wrathful aspects of Shiva (Mahadeva) and his consort Parvati (Mahadevi), they each have four arms and Kalaratri's body is extremely thin and emaciated. Chakrasamvara is embraced by his red consort, Vajravarahi, who presses her naked body against his in the bliss of sexual union, with her two thighs wrapped around his waist, her left hand holding a blood-filled skull-cup as she embraces the neck of her lord, and her right hand holding aloft a curved knife. Encircling the central dais and fiery aura of Chakrasamvara and Vajravarahi is a lotus-circle with eight variegated petals, which is known as the 'Wheel of Great Bliss'. Upon the four cardinal petals of this wheel appear the four 'heart-dakinis', who arise from the syllables of the 'Four Mothers', and whose directional colours also correspond to the four faces of Chakrasamvara: with blue-black Dakini in the east (front face), green Lama in the north (left face), red Khandarohi in the west (rear face), and yellow Rupini in the south (right face). Each of these goddesses is identical in appearance, and their naked bodies are adorned with the five bone ornaments, a five-skull crown, and a garland of fifty dry white skulls. They each have three eyes and stand in alidha posture upon a sun disc and lotus, with their lowered right hands holding a curved knife, their left hands holding a skull-cup in front of their heart, and a tantric-staff or khatvanga resting in the crook of their left arms. Upon each of the four inter-cardinal petals of this Wheel of Great Bliss appears a golden vase with a white skull-cup resting on its top, with each skull containing various 'nectars' that symbolize the 'four-fold offering' to the sense-goddesses of sight, smell, taste and touch. The next three circles or wheels are divided into eight directional vajra-like spokes or segments, which collectively contain the twenty-four dakas or 'heroes', and the twenty-four dakinis or 'heroines'. These male and female deities are visualized in various parts of the practitioner's subtle-body, and they geographically correspond to the twenty-four sacred sites or 'seats' (pitha) of the ancient Indian tantric traditions. Each of the twenty-four dakas appears in sexual union with his consort or dakini, with each couple being similar in appearance to the two-armed aspects of Chakrasamvara and Vajravarahi, with one face and three eyes. The dakas stand in alidha posture upon a sun disc and lotus, with their right and left arms crossed as they embrace their dakini consorts whilst holding a vajra and bell. Collectively these forty-eight male and female deities are divided into three groups of sixteen blue, red, and white couples in sexual union that respectively occupy the eight directional segments of the three concentric circles or wheels: with the first circle containing the sixteen blue deities of the blue 'Mind Wheel', the second circle containing the sixteen red deities of the red 'Speech Wheel', and the third circle containing the sixteen white deities of the white 'Body Wheel'. The positions that these deities occupy rotate in an anticlockwise sequence of east, north, west and south for the cardinal directions, and a clockwise sequence of southeast, southwest, northwest and northeast for the inter-cardinal directions. Within the four coloured quadrants of the mandala's inner square and directional gateways are the eight dakini goddesses of the outer 'Commitment Wheel', who occupy the four gateways and the four corners of the mandala as guardians or keepers. The guardian-goddesses of the four gateways appear in the same bodily forms and colours of the four 'heart-dakinis' described above, except that they have the heads of two birds and two animals. In the eastern gateway is black crow-faced Kakasya; in the northern gateway is green owl-faced Ulukasya; in the western gateway is red dog-faced Shvanasya, and in the southern gateway is yellow boar-faced Shukarasya. The guardian-goddesses of the four corners are also similar in appearance to the four 'heart-dakinis', except that each side of their faces and bodies are coloured to correspond to the inter-cardinal quadrants in which they stand. These four goddesses are the yoginis of Yama Dharmaraja, the 'Lord of the Dead'. In the southeast corner is Yamadadhi, whose right and left sides are blue and yellow. In the southwest corner is Yamadhuti, whose right and left sides are yellow and red. In the northwest corner is Yamadamstrini, whose right and left sides are red and green. And in the northeast corner is Yamamathani, whose right and left sides are green and blue. Collectively the four heart-dakinis of the Great Bliss Wheel, the sixteen deities of the blue Mind Wheel, the sixteen deities of the red Speech Wheel, the sixteen deities of the white Body Wheel, and the eight deities of the outer Commitment Wheel, constitute a retinue of sixty deities, which along with Chakrasamvara and Vajravarahi manifests as the sixty-two-deity mandala of Chakrasamvara. The square geometric structure of the mandala palace itself is intricately ornamented with all manner of decorative elements and auspicious offerings. The sixteen offering goddesses appear on the red plinth that surrounds the palace's five-coloured walls, with vajra-marked crescent moons positioned at the corners and ends of the plinth to symbolize the union of relative and absolute bodhicitta. The four outer corners of the square represent the ornate structure of the roof, with a red beam representing the frieze of the five elements, then a blue section with hanging loops of jewels that represents the roof's jeweled and latticed ventilation structure, and above this are two white sections that represent the rain-spouts and the lotus parapet that crowns the top of the roof. The intricate pillars, arches and layered lintel structures of the four gateways ascend above each directional side of the square, with paired monkeys, lions, peacocks and deer appearing upon their ornate steps. Two makaras and the serpent-devouring face of kirtimukha guard each of the gateway's arched toranas, beneath which hang loops of jewels and red yak-tail pendants. Enclosing these four gateways are the prongs of the vast crossed-vajra that underlies and supports the base of the entire mandala palace, with its prongs coloured to correspond to the four directions. And on either side of the makara-heads from which these prongs emanate are the roof ornaments of ritual vases, various jeweled emblems, and the eight auspicious symbols. A scrolling ring of jewels encircles the outer structure of the mandala palace, and outside of this are the three great protection wheels of the 'lotus-womb', the 'vajra-fence and canopy', and the 'mountain of fire', which respectively protect the mandala from floods, earthquakes, and conflagration. The 'lotus-womb' symbolizes the purity of being reborn or initiated into the mandala, and it is depicted here as a circle of forty-eight variegated double-lotus petals. The 'vajra-fence and canopy' is an impenetrable hemisphere of interlocking vajras that completely covers the entire mandala to protect it from vow-breakers, and it is depicted here as a narrow red ring with forty-eight black vajras encircling it. The 'mountain of fire' is a vast hemispherical dome of flames that likewise covers the entire mandala and burns away all impurities, and it is represented here by a ring of forty-eight variegated banks of wisdom-fire that rotate in a clockwise direction. In the sky directly above the mandala is the trinity of blue Akshobhya Buddha (centre), four-armed yellow Prajnaparamita (left), and four-armed Avalokiteshvara, who respectively represent the 'Three Jewels' of the Buddha, Dharma and Sangha. In the upper left corner is sixteen-armed Hevajra with his blue consort, Nairatma; and in the upper right corner is twenty-four armed Kalachakra with his golden consort, Vishvamata. In the lower left and right corners are two of the four principal Newar Buddhist aspects of Vajrayogini, whose temples are located at Sankhu and Bijeshvari. Sankhu Vajrayogini (left corner) manifests in the form of Naro Khechari, or Naropa's Dakini, who is red in colour and stands in alidha posture upon the supine forms of black Bhairava and red Kalaratri. Her head is inclined upward towards the left as she drinks fresh blood from the skull-cup held in her raised left hand. Her right hand points downward as she circles her curved-knife, and her khatvanga rests across her left shoulder. Bijeshvari Vajrayogini (right corner) manifests in the form of Vidyadhari, the 'knowledge-holder', who is also known as Maitripa's Dakini, or as Akash Yogini, the 'space-yogini'. She is similar in appearance to Naro Khechari, except that she flies above her sun disc and lotus with her raised left leg held in the crook of her left arm. The lower area of the painting depicts a beautiful landscape of rocks, trees, mountains, lakes and waterfalls, with the figure of the river goddess Ganga appearing amidst the cascading waterfall at the left, and a mahasiddha, two deer, and various birds appearing in the lower foreground. Four-armed Ganapati stands at the bottom centre, with the wrathful forms of blue Vajrapani and red Khadgapani flanking him to the left and right. The inner border of the painting is decorated with brocade designs, and the dark outer border or torana with a complex assembly of auspicious motifs and mythical creatures. At the top centre is the crowning form of a red garuda with his blue wings spread wide, and flanking garuda are a male and female naga-serpent, both of whom appear in human forms with long serpentine tails. Crouching upon lotuses in the upper corners are two kinnaras, the semi-divine beings that serve as musicians to the gods. They have golden upper bodies and bird-like lower bodies with long scrolling tails, and their two hands are palms-folded in adoration. Ascending on either side of the torana are ornate pillars, with roaring blue lions embracing the upper sections of the pillars, and jewel-grasping red dragons coiled around their lower sections. In the lower corners are two roaring white lions, and on either side of the emblem at the bottom centre are two female naga-serpents, with yellow human upper bodies and the lower bodies of serpents. The emblem's curved red plaque bears the inscription: Shri Cakrasambara Mandala-ya Nama; and the lower plaque bears the name of the artist, Ratna Gopal Sinkhwal, and the Nepali year or samvat 1125 (2005).